Meh, I asked my nigerian friend about this and she says its normal. a lot of people that live outside the citys have a strong belief in vodoo and witchcraft. Even she. Hmm.. Just imagine how the police arrested the goat. "Freeze, mister goat! Drop your horns! Drop them now!!" That explains how Hitler really escaped from Berlin. He fooled us all. "Seit 5:45 Uhr wird zurr-rückkgeschossen." 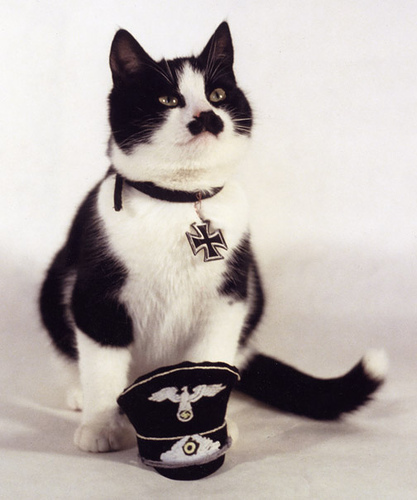 Tedacious;4783026Cats That Look Like Hitler! This is an interesting thread... first I thought that the news story was one of the most retarded and random things I've read in a while.